There's nothing finer than eating at the diner! Now your HO folks can dine on some great 'burgers, fries and shakes while railfanning! Our Route 22 Diner Kit is an accurate replica of a stainless steel diner found throughout the country from the 1940s to the present. It looks "right" in the largest cities or by itself on a country road. It's a true piece of American roadside architecture! 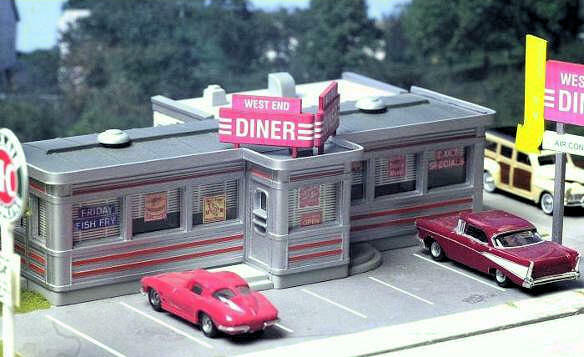 Our HO scale kit includes the diner, kitchen addition in the rear, large freestanding sign (only partially visible in photo), printed paper signs and easy-to-follow instructions that include tips on achieving a realistic stainless steel finish. Microscale has two decal sets for our diner, one has red accents the other has blue accents.